One of the more agreeable threats to the health and sanity of New Orleanians is the abundance of festive events and the “Fear Of Missing Out” that compels attendance at as many events as one can squeeze in. It seems that the string of “fests” is interrupted only by holidays. For beer-lovers, the next thing that must not be missed is Winterfest. Winterfest is put on by Crescent City Homebrewers, and will take place on Saturday, December 1, 2018, at the new Deutsches Haus. There will be music, food, and other manifestations of local German culture. But for our purposes, it’s all about the more than 50 commercial and home-brewed beers that will be available. The skill and imagination of local zymurgical geniuses will be on full display. If you can’t make Winterfest, fear not, because, I now present to you what is absolutely the best and most comprehensive guide to craft beer in New Orleans (except for places I forgot, or don’t know about, or haven’t been to, or didn’t have room for, or left off the list for no discernible reason). So really, what follows not a “best of” anything list. 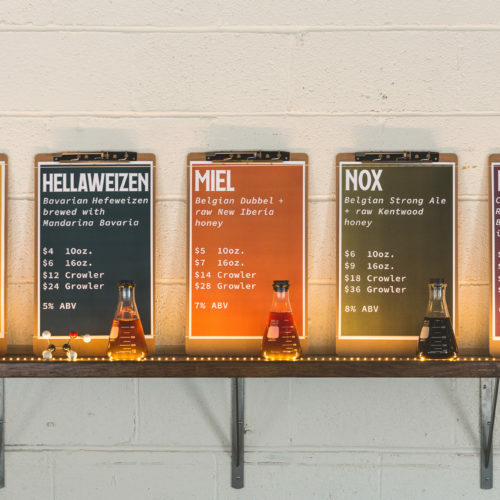 Such lists are exercises in arbitrariness, even when done by trained professionals, as shown by the recent piece in Esquire about “seven renowned establishments” in the New Orleans craft beer scene. To be fair, the Esquire writer did not claim that his seven places were the “best” seven, and there’s nothing inherently wrong with them. It’s just that some of them, like DBA and the Ritz-Carlton, don’t immediately leap to the mind when craft beer is mentioned. My list is rather an attempt to do the only thing anyone really can do, which is to say what I know, to admit what I don’t know, and to give an honest account of what I see. The list began as something I threw together… I mean, “meticulously researched and curated” for the 2018 convention of the National Association of Appellate Court Attorneys (NAACA), a group not quite as rowdy as its name suggests. I wanted to tell the staff attorneys where to find good beer near their hotel in the French Quarter. I had help from the usual Friday gang at the Avenue Pub and some friends in a beer and religion discussion group. (Yes, that’s a real thing.) Objectively, the list should include all of the microbreweries and brewpubs in the city, but not all of the brewpubs and microbreweries in Louisiana. Deleted from the original the list is Wayward Owl. I don’t have all the facts, but the closing of the Owl’s brewery and taproom at the old Gem Theatre was an ugly end to what had seemed like a beautiful thing. The taproom was a neat space, and some of the Owl’s beers had loyal followings. I’ll miss my favorite, Tawny Twit, the Owl’s take on an English bitter. Nothing I hear suggests that any Wayward Owl beer will be “gypsy brewed,” and I have not heard when the Gem Theatre might have a new brewing tenant. The fate of the Owl (as well as the late 40 Arpent brewery) is a reminder that behind the clever beer names and glib reviews on Untappd, it’s hard work to make a living in a competitive business, even when the work is a labor of love. And now, onto that list. Brieux Carré is on the edge of the Quarter and the Marigny near the river end of Frenchmen St. It’s amazing that such variety and quantity of good beer can come from this tiny spot. The narrow taproom is snugger than the sweater my mother-in-law gave me three years go, but the courtyard offers some elbow room. Courtyard Brewery in the Lower Garden District has a generous selection of their own imaginative beer, augmented with rotating “guest taps” of local and national craft beer. Sometimes my bicycle just takes me there. A Mid-CIty location is on the way in 2020. Crescent City Brewhouse is a restaurant but was the first brewpub in this city (1991). The beers are mostly traditional German styles, but they had an IPA last time I looked. Because CCBH is on a touristy bit of Decatur St., locals tend to overlook it. In a similar vein, Gordon Biersch on Poydras is a restaurant with beer brewed in the house. As I recall, Gordon Biersch has a bit more variety than CCBH, but it too is often overlooked by locals. In both places, excellent beer is hiding in plain sight. 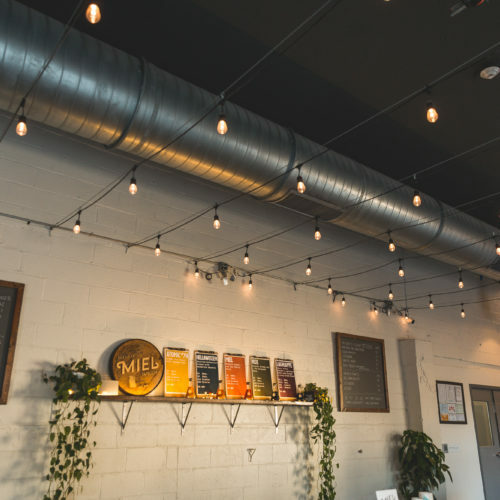 Miel is the newest microbrewery in the city. True to its name, which means honey, it is a sweet little indoor/outdoor spot in the Irish Channel just off Tchoupitoulas. Miel started with three beers but more are out and more are on the way. Take note that Miel is a “no cash” operation. NOLA Brewing is the city’s oldest microbrewery (2008). There’s always a good variety there, plus McClure’s BBQ. The balcony overlooks some lovely (yes, lovely) railroad tracks and a dock. But that’s just the right view for this busy brewery in a busy port. Parleaux Beer Lab is in the Bywater. I haven’t been lately. But I really loved the place and the two or six beers I had the last time I went. Time for more research. Port Orleans Brewing Co features a nice tap room, restaurant, and courtyard uptown near Napoleon. When I’m uptown, it’s almost too easy to drop in and sample what’s new while the cars go by on Tchoupitoulas. Royal Brewery is out by the Lakefront and has limited weekend-only taproom hours. I’ve never been there, but I drank their Culicidae ale at a little bar near the Riverwalk. Though it started nice and malty on the front end, it proved too bitter for me on the back end. But I’m game to give their stuff another try. 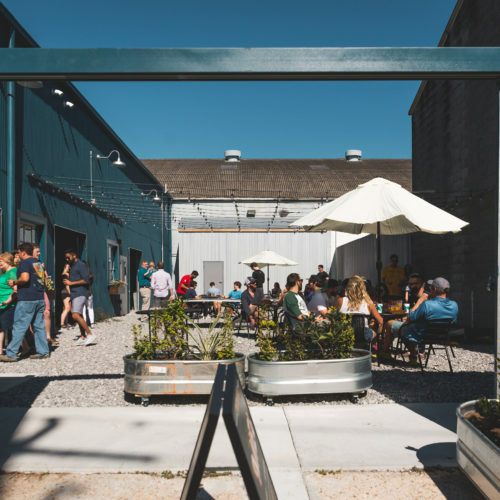 Second Line Brewery near City Park Avenue, is a good excuse and a better reward for a bicycle ride up the Lafitte Greenway, actually a block or two past the Greenaway. It’s a pretty, quiet, and relaxing spot, with a small but nice variety. Alway worth the trip, even in the rain. Urban South Brewery keeps coming out with new and interesting beers, usually on Friday; many disappear quickly, because they’re good. Disclaimer: I know Urban South’s owner Jacob Landry from outside the beer trade. When a few friends volunteered to help get the brewery ready for inspection, I drew bathroom duty. My shirt got ruined by toilet cleaner, and the t-shirt Jacob gave me was too small. Not that I’m bitter. *Side note: Urban South, in the Lower Garden District, is at the downriver end of what would be a fun Tchoupitoulas Street bike-and-beer ride, with Urban South and Port Orleans as bookends and Miel and NOLA in between. Or better still, start at Courtyard Brewery. Helpful hint: Taking the streets parallel to Tchoupitoulas will increase your chance of surviving to enjoy each place. 504 Craft Beer Reserve is on Tulane Avenue near Carrollton. I thought it would be just “a beer store with some taps.” That humble expectation was blown away on my first visit. It’s a beautiful place, with an impressive selection of beer to drink in the house or to take home with you. The Avenue Pub is commonly rated one of the best bars in the solar system. I confess that I love this place and its owner, Polly Watts. If I’m not there on Friday at 5:– PM, it might be because I was abducted by aliens, again. The Bulldog has locations Uptown on Magazine St. and on Canal Blvd. near the cemeteries. Even though I don’t go there much, they make my list because they were among the earliest places known for their multitude of taps. Next time I get near one, I’m going in. Cooter Brown’s has been a favorite since 1977; they served out-of-the-ordinary beers before anybody else. There’s a large selection in the main bar, plus a craft beer bar in the back called the Snooty Cooter, aka “Snooter’s.” Lot’s of sports are on the TVs. Finn McCool’s must be listed on general principles of good drinking. 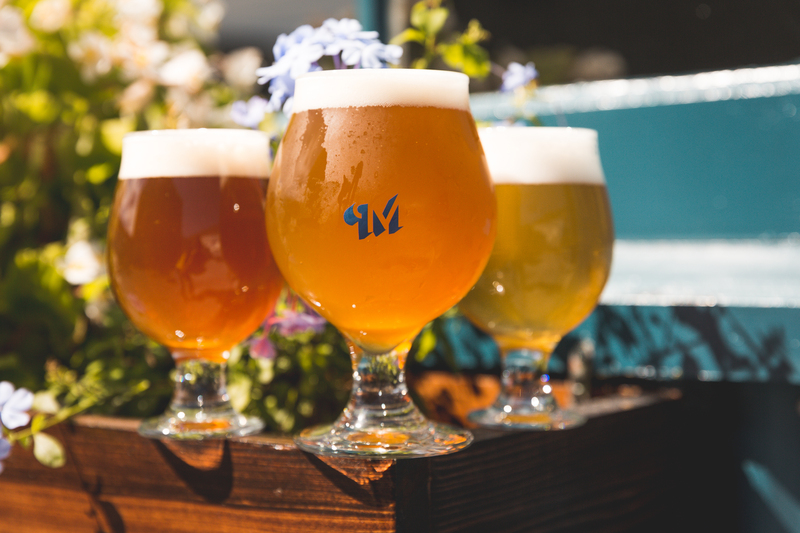 Finn’s has a top-class beer selection in the most congenial atmosphere, inside and out. It’s also the place to watch rugby and the football Americans call soccer. The Crown & Anchor English Pub is reason enough to take the ferry to Algiers Point. After enjoying the best view of the city across the River, pass through the TARDIS into a true neighborhood pub with a genuine English look and feel. 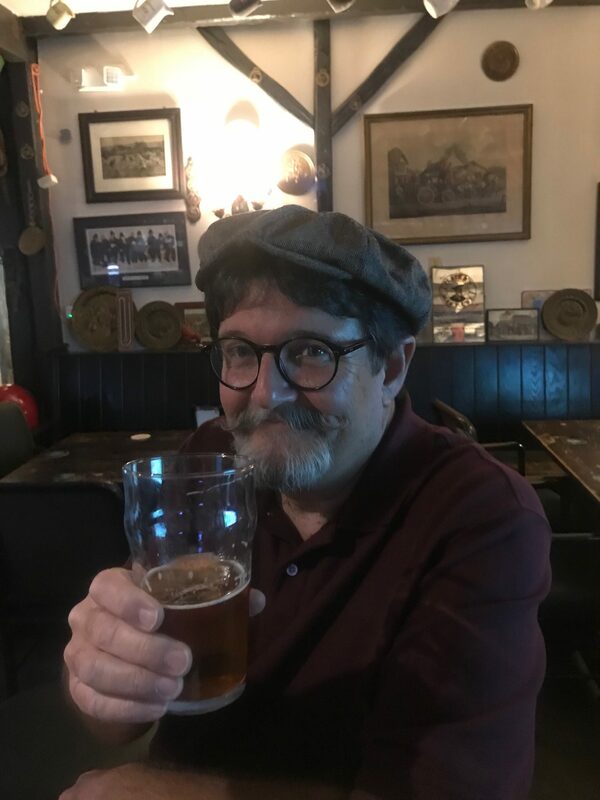 Don’t tell Polly, but this is my favorite pub, because I’ve been going there since it became the Crown & Anchor, and because I can safely bike there and back from my house, well, except for that broken leg thing, but anyway. While you’re on the Point, visit The Old Point Bar — good beer selection, terrific jukebox, live music. There’s a lot of good beer out there, and a lot of beer people who need our support. So get out there and drink what you love, generously but responsibly, or at least nicely.